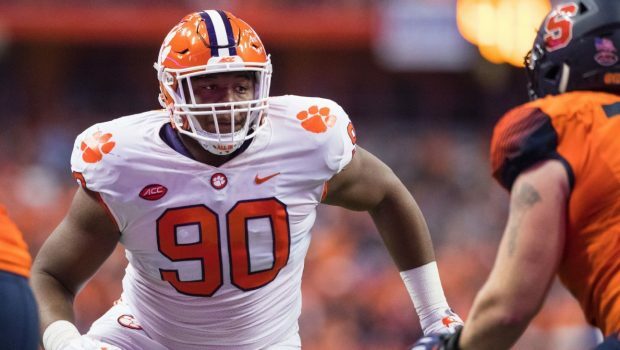 EAGLES CONSENSUS DRAFT PICK: CLEMSON DT DEXTER LAWRENCE! The NFL draft is still two and a half months away in Nashville, and the Eagles have the 25th pick in the first round. It’s no secret that the Eagles want a cornerback, but this is some really, really good value. Put Lawrence next to Fletcher Cox and let those two plug the middle of a line that was in the bottom third in rush defense this season. 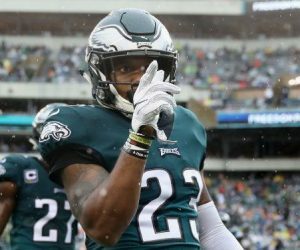 There are a number of short and long-term concerns for the Eagles secondary on a defense that gave up the most passing yards in the NFC last season. A versatile defender with dynamic playmaking upside, Adderley would be a welcomed addition. Adderley’s range, ball skills, coverage awareness, processing skills, physicality and tackling ability are all plus traits and he checks a lot of boxes. Adderley was an absolute joy to study on film and is a first-round safety all day long, assuming he tests where I believe he will. This might not be a rational, pick. But give me this one. 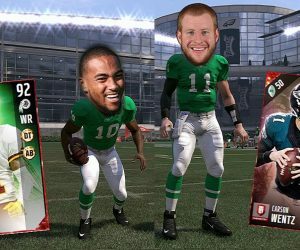 I want the DeSean Jackson clone in green, grey and white. If Haloti Ngata, who’s due to become a free agent, doesn’t return, Lawrence would be a good replacement. [Eagles trade down from No. 25 to No. 29] — Somewhat of a fall for Metcalf, but the neck injury and his lack of ability to run a full route tree are the reasons. 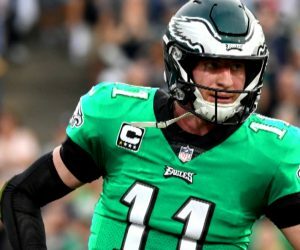 The Eagles could be interested in more receiving weapons for Carson Wentz. Philadelphia gets Kansas City’s third in this deal. Willis didn’t attend the Senior Bowl but he remains of the best defensive tackles in a ridiculously deep class of them. His ability to wreak havoc in the backfield will upgrade an Eagles’ unit that ranked 26th in pressuring the quarterback. The Eagles add an explosive bull-rusher to supplant the league’s preeminent bull-rusher in Brandon Graham. Philly can’t let their calling card defensively start to crumble. With Haloti Ngata scheduled to be a free agent and Timmy Jernigan’s future up in the air, upgrading the interior of the defensive line is a possibility here. Lawrence is a rare mover for his size with the skills to be an above average run defender and developing pass rusher. The Philadelphia Eagles have a solid secondary but could use help at the cornerback position, especially in the slot. Washington’s Byron Murphy is feisty, technically smooth and has shown excellent ball skills. So why is he on the board here? Teams could knock him for his lack of bulk on a 5’11” frame. Murphy has been electric the last two seasons at Washington, oftentimes showing up the teammates around him from previous draft classes. The Eagles could quickly fall in love with his playmaking skills and ability to close on the ball with special quickness and physicality. Along with edge rushers and wide receivers, the Eagles face big decisions at linebacker with no less than four at the position set to enter free agency, including standout middle linebacker Jordan Hicks. Rather than pay a premium price to retain him, GM Howie Roseman may opt for a cheaper contract with the versatile and hard-hitting White. The Eagles haven’t drafted a running back in the first round since 1986, and the relative value of players at the position has only diminished in the decades since. But the Eagles seem likely to part ways with free agent Jay Ajayi and possibly Darren Sproles, and there’s not much star power elsewhere. Jacobs wasn’t a starter at Alabama but projects as a potential every-down back in the NFL, with a hard-nosed running style and well-rounded receiving skill set. There are bigger needs elsewhere on both sides of the ball for the Eagles, but that won’t stop them from taking one of the most dynamic playmakers in this draft if he’s still on the board. Jacobs was part of a loaded backfield at Alabama, but has the skills to be a full-time problem for NFL defenses. The Eagles are not the same offense without a consistent run game. Jacobs is the total package with a lot of tread left on his tires — only 300 total touches in three years at Tuscaloosa. Top needs: OL, RB, CB. This pick is building plenty of steam because the team’s need and the player’s skill set have started to line up so well. The Eagles could use a space-eater to flank Fletcher Cox and Lawrence is a textbook inside run-stuffer with ideal size (6-4, 351 pounds). For all of the hand-wringing over Philadelphia’s secondary, the once-dominant defensive line didn’t create the same kind of havoc it did in the 2017 Super Bowl campaign. At 6-4 and 340 pounds, the massive Lawrence can help dissuade opponents from double-teaming Fletcher Cox regularly while he plugs the middle. It was a nightmare season for the Eagles pass defense, which ranked 30th in the league. Philly could easily go with a cornerback or safety, although they do have some key pieces returning from injury to bolster the secondary. There is arguably even more uncertainty at linebacker, especially in the middle where the injury-prone Jordan Hicks is a free agent. The Crimson Tide always seem to have a stud inside ‘backer to anchor their defense. When Reggie Ragland went to the NFL they plugged in Reuben Foster. When Foster left it was Rashaan Evans’ turn. This year it was Mack Wilson, who very much fits within the parameters of that explosive, physical, aggressive, hard-hitting profile. The athletic Wilson is more than just a two-down run thumper though, displaying sideline to sideline range as well as the ability to excel in coverage. Previous EAGLES OFFSEASON DATES: FOLES CAN BE FRANCHISED FEB. 19! Next HERE’S PHILS OPENING DAY ROSTER WITHOUT MACHADO AND HARPER!